His Beatitude Sviatoslav: Unity of Catholics and Orthodox is not utopian thinking "Every effort must be made to restore the original unity of the Church of Kyiv in its Orthodox and Catholic branches". Archbishop Shevchuk on the 'silent war' no one cares about It's a conflict that's been raging in Ukraine for two years, costing thousands of lives and displacing millions of people. But the international community seems to have largely forgotten about it. «Two Parallel Worlds» – An Interview with His Beatitude Sviatoslav On February 12, Pope Francis and Patriarch Kirill, the leaders of two Churches, met at the Jose Marti International Airport in Havana. The meeting took place in a closed setting. It lasted more than two hours. Head of the UGCC: Ukrainian conflict is Europe's biggest crisis since WWII The Head of Ukraine’s Greek Catholic Church said the country is facing a “humanitarian catastrophe” with global consequences that cannot be ignored by the international community. 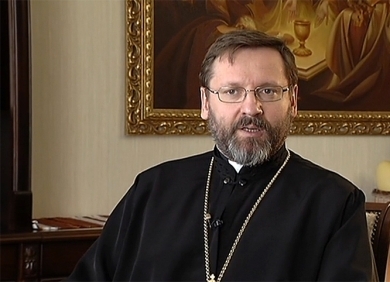 Archbishop Sviatoslav Shevchuk: Ukrainian Christians Still Clinging to Hope Major Archbishop of the Ukrainian Greek Catholic Church Says War Is "Greatest Humanitarian Catastrophe" Since WWII.